A modest 6mm in diameter, yet still sturdy and capable as a lifting option, this 6×19 galvanised rope variation is one of the vast line up of wire rope products that can be made to order and shipped with all the fittings you need. 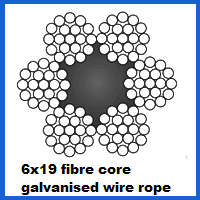 There are a pair of WLLs listed for this 6mm 6×19 Galvanised Wire Rope in the table of technical data you will find below, the greatest of which is 2,208kg. While the construction of the two types of rope in this range is the same, the difference in performance comes from the quality of steel used. Your needs and budget can determine which of the options you select. Each example offers identical corrosion resistant properties because the steel wires have been galvanised and wrapped around a fibre core. Moisture which might usually rust this type of material will be unable to leave its mark on the surface and the usable life of the rope will be extended as a result. Turnbuckles and rigging screws, snap hooks, sockets and terminals are just a small example of the kinds of attachments that can be added to your 6×19 galvanised rope in this 6mm diameter configuration. If you want an entire assembly constructed to your requirements, which is also an option available here at Rope Services Direct. You can get a quote, ask a question or learn all there is to know about wire rope by calling 01384 78004 or emailing the RSD experts today. 6mm 6x19 Galvanised Wire Rope Overall rating: 5 out of 5 based on 6 reviews.